Both being cheerful and bubbly people, it is no wonder Alex and Juan are social butterflies with a large circle of friends. 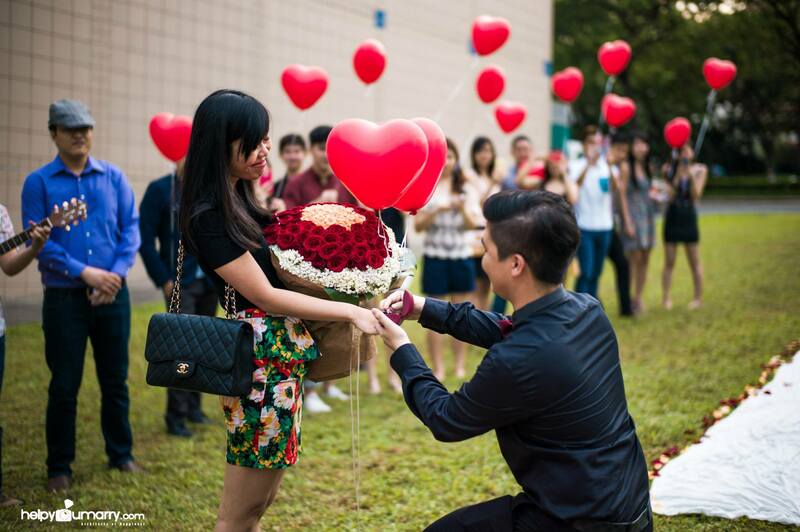 They also have one more thing in common – they are super fans of Taiwan International Popstar, Jay Chou. A few years into their relationship, Juan would occasionally tease Alex about how her ideal proposal would be like. “Honey! They often say that Paris is the City of Love and many couples get married there! It is so nice to have the Eiffel Tower in their wedding pictures!” Juan hinted. 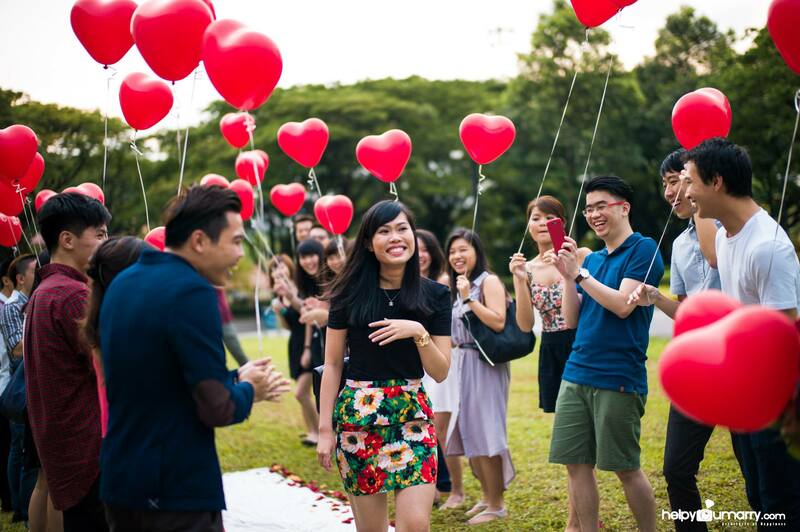 Alex simply laughed it off, but he actually had plans to realise her ideal proposal. 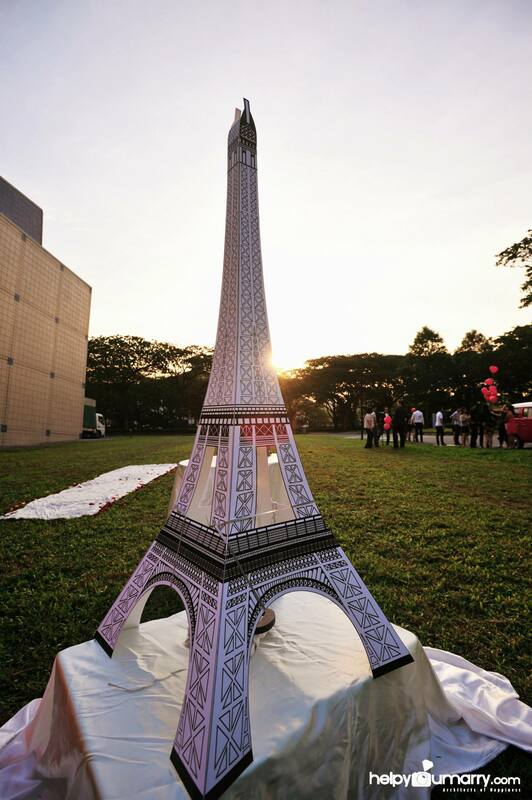 Thus, he engaged our services and we managed to craft a 1.5m tall Eiffel Tower, just for Juan. Knowing that she is also a fan of the Volkswagon Kombi, Alex had specially made requests for Juan to be chauffeured in the Kombi to dinner with him one night. “Juan love! I’m waiting downstairs now, come down when you’re ready!” Alex hung up and Juan did some quick final touches to her hair before heading downstairs. Instead of seeing Alex, she was greeted by an usher who brought her up to the Kombi that was parked downstairs. 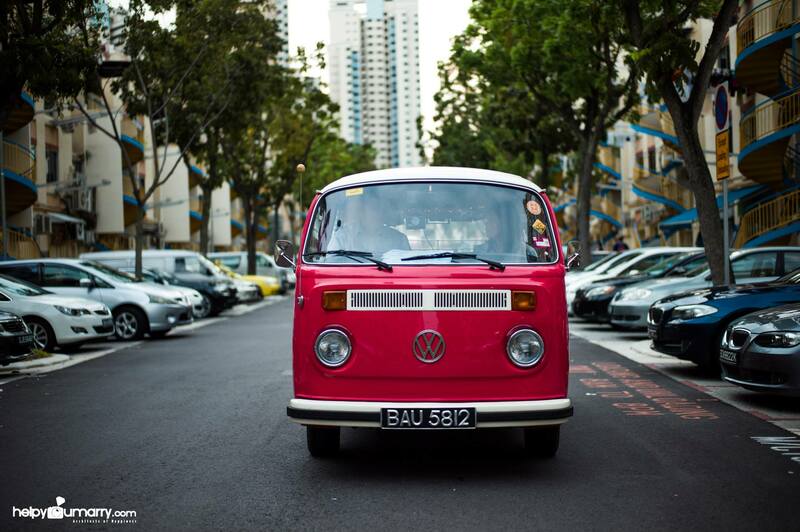 Wow, that is really one nice Kombi! I wonder what is the boy up to. 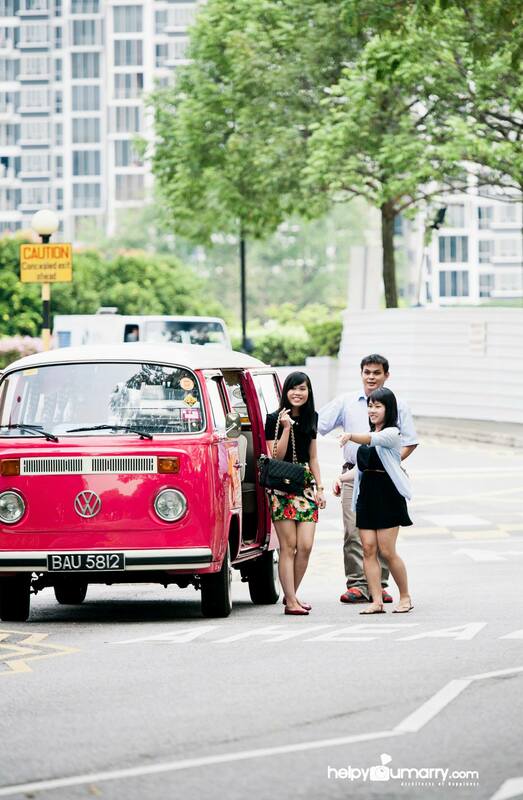 Juan thought silently to herself as the usher led her up the Kombi. The usher started the car, when Juan found an iPad that was placed on her 2 o’clock angle with a video ready for her. Curious, she went and clicked play. 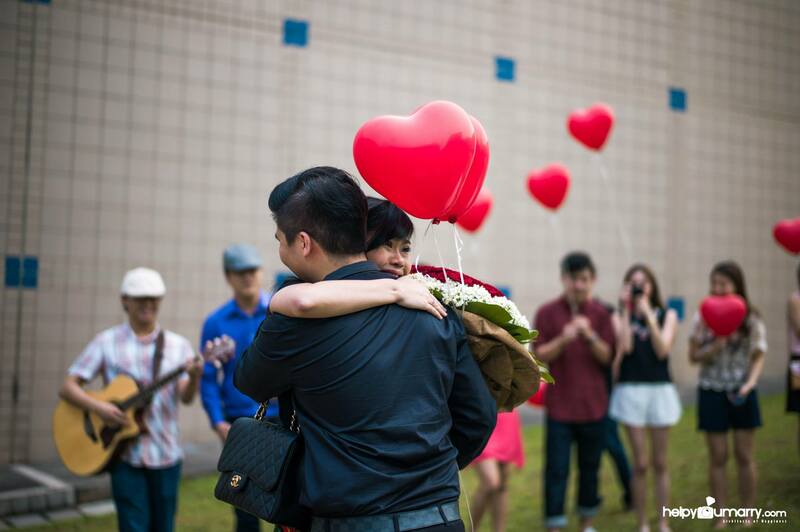 To her surprise, what played was a remake of Jay Chou’s MV, 简单爱 (Simply Love) but instead of Jay Chou in the MV, it was Alex! He even went to the extent of finding the clothes and wig that was the closest looking to the ones in Jay Chou’s MV. A mix of emotions surged within Juan’s body as she couldn’t help but laugh and cry at the same time. “It’s so funny but I don’t know why I am crying!” Juan kept wiping tears off her face as she kept hitting the replay button whenever the video ended. In her journey to her dinner destination, she had already watched the video a total of 3 times. The Kombi soon came to a halt. She got out of the bus, and screened the surroundings when a sense of familiarity fell over her. 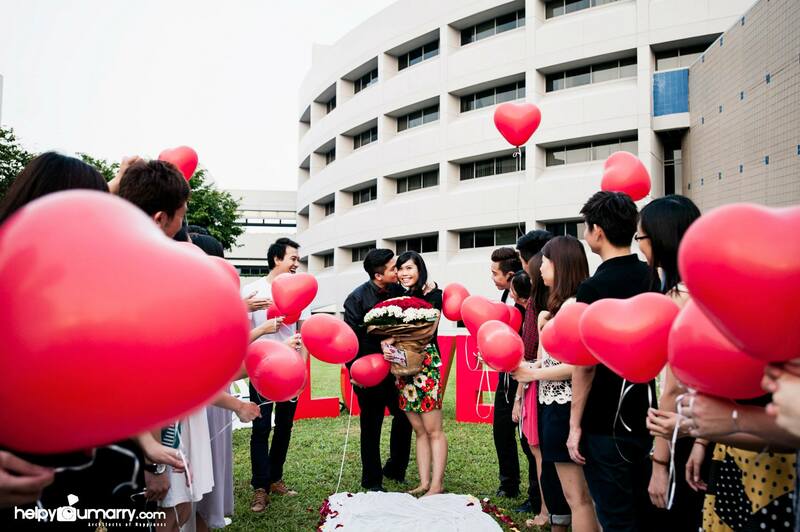 The bus had brought her to Nanyang Polytechnic – the place where she first met Alex. Suddenly her ears picked up a whizzing sound, it was a small remote control toy car that had stopped at her feet with the words that said follow me. 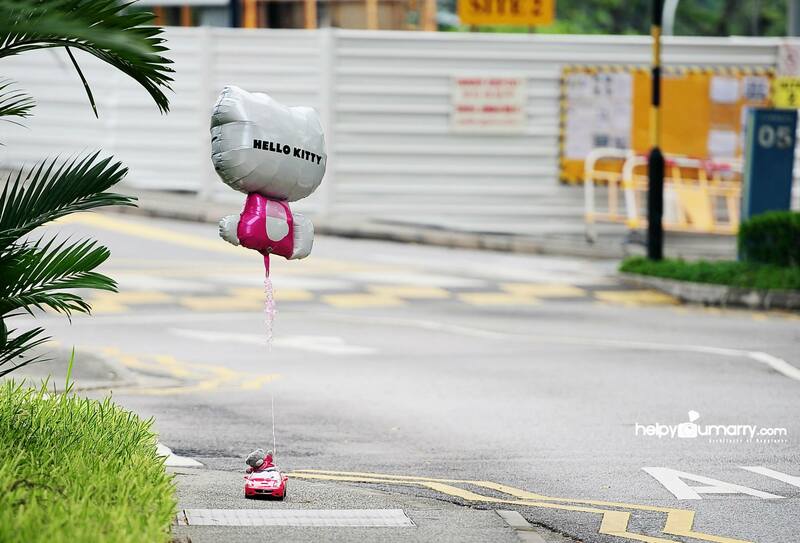 Without hesitation, she followed as the car trailed along, leading her to the final destination. Greeting her were two rows of friends lined up at the side, cheering upon her arrival. 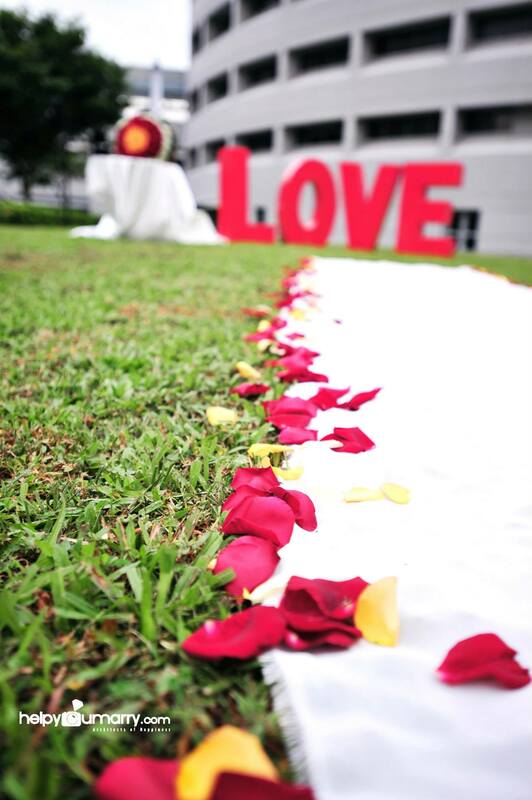 At the end of the lines of friends stood Alex, holding a bouquet of 99 roses with the mini Eiffel Tower structure beside him. Overwhelmed by the atmosphere, Juan burst out in tears of joy as she made her way to Alex. Alex smiled to himself as he thought this girl is so beautiful even when she’s crying. Juan stood in front of him as Alex gently wiped the tears off her face and whispered “you look so beautiful today love”. Juan couldn’t help but smile and turned away in shyness. It was just like the time when they first fell in love. Alex knelt down as everybody fell silent, awaiting the most important question. The atmosphere once again exploded into cheers, joys and laughter as Juan nodded her head. The two newly wedded couple then left in the Kombi for their proposal celebration to complete the happiest day of their lives. Proposal Pre-Video for Juan to enjoy on her journey to meet him.